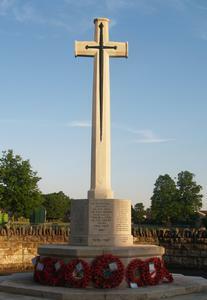 Cross of sacrifice on octagonal three stepped base with a bronze sword on front face. 2017: memorial was restored. Work included repair of cracked stone and joint gaps, re-painting of the inscriptions and cleaning. 1990/1991: cleaning and re-pointing planned.